The music within Subversions varies between eccentric and eclectic, experimental and improvisational, sometimes nearly inaccessible, but mostly friendly and interesting. On the latter end are Eight Tons of Fuss and Grillz. To the former, Astor and Who's Your Poser are representative. It's all an exercise in creativity and individual expression, really. Something that any musician-craftsman aspires to in his heart of hearts. For guitar enthusiasts, Baker offers the equipment, without mentioning a particular brand, he uses on every track. As for the score above, since I don't normally receive (very little that is) or listen to experimental guitar music, it merely reflects the fact that I have nothing to compare this too. Otherwise, if you have an interest in clever and experimental guitar work, whether as a player or listener, you'll enjoy this progressive album. 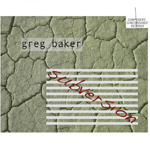 If you have an interest in clever and experimental guitar work, whether as a player or listener, you'll enjoy Greg Baker's Subversions.